Stir over ice and pour into a rocks glass with a big ice cube (laser etching optional). Garnish with the grapefruit peel. Combine in a pan and stir over low to medium heat until the sugar is dissolved, taking care that it doesn’t spill over. Let cool and skim any foam, then bottle and refrigerate. You should feel free to scale down the recipe and drink the remaining beer. Created with Michael Lorberbaum for Widmer Brothers brewing at Multnomah Whiskey Library. Shake, strain into an ice-filled rocks glass, and garnish with a lemon twist. The Genki-Su vinegars are very good and can be purchased online. Shake all but the soda water with ice and strain into a wine glass or champagne flute. Top with a few ounces of soda water and garnish with a cherry or other fruit. 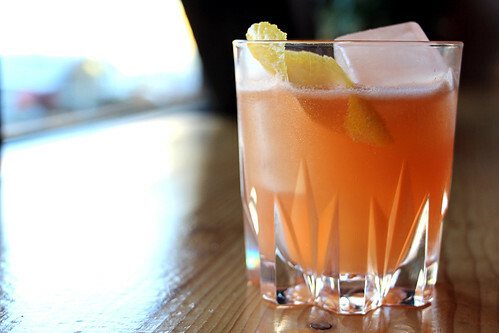 According to Ted Haigh in Vintage Spirits and Forgotten Cocktails, the Straits Sling is the predecessor to the Singapore Sling and first appeared in Robert Vermeire’s 1922 book Cocktails and How to Mix Them. It’s much drier than the Singapore Sling, thanks to the use of real cherry eau de vie rather than cherry liqueur. Go easy on the soda lest the drink become too thin. Shake all ingredients with ice and fine-strain into an ice-filled rocks glass. Optionally garnish with a slice of pickled crab apple. This contemporary take on the Stone Fence is a cocktail I came up with for the 2009 Great American Distillers Festival cocktail competition. *To make the smoked apple puree, peel a few apples (I use Jonagolds) and slice into wedges. Smoke at a low temperature for several hours until they have absorbed smoke flavor. Puree in a blender, using fresh, unfiltered apple cider to add liquid as necessary. You’ll end up with what’s essentially very aromatic, smoky apple sauce. Combine ingredients in an ice-filled rocks glass. This is a more modern version of the original Stone Fence, with bourbon and sweet cider replacing funky rum and hard cider. The bitters aren’t traditional but are a nice touch. Stir with ice and strain into a chilled cocktail glass. Garnish with an orange or lemon twist. 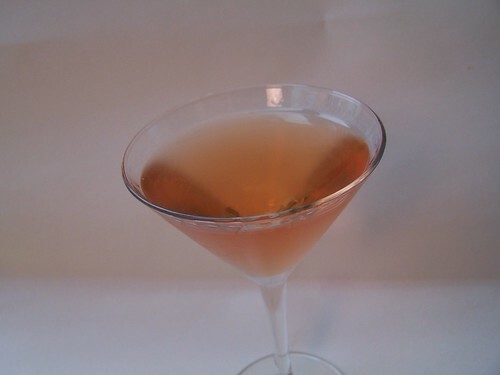 The drink originally appears in the Café Royal Cocktail Book, a 1937 publication of the United Kingdom Bartenders Guild. Compiled by William J. Tarling, the credit for this drink is given to “A. Mackintosh.” I was turned onto it by Jeffrey Morgenthaler, who I think came across it at the Bar Convent Berlin and offered it on the Clyde Common cocktail menu for a while.